The western blotting is a well-established technique used in molecular biology to detect specific proteins from a complex mixture of proteins extracted from tissue or cells. Synthetic or animal-derived antibodies are created that react with a specific target protein. The sample material undergoes protein denaturation, followed by gel electrophoresis. Next, the electrophoresis membrane is washed in a solution containing the specific antibody. The excess antibody is then washed off, and a secondary antibody that reacts with the first antibody is added. Through various methods such as staining, immunofluorescence, and radioactivity, the secondary antibody can then allow visualisation of the protein. Improved on the basic RIPA buffer, containing protease inhibitors and phosphatase inhibitors. The protein from the lysate is active, and retains the properties and functions, properly. It is suitable for co-IP. The protein cleavage under non-denaturation condition, the product retains the protein characteristics and functions to the maximum extent it is suitable for co-IP. Note: The reagent of protein extraction containing detergent is not suitable for Bradford Assay Kit (PC0010). Please select BCA Protein Assay Kit (PC0020) or Lowry Protein Assay Kit (PC0030). The protein content will be determined by comparing the absorbance of sample to the absorption coefficient determined from a standard curve. A standard curve is prepared by plotting the absorbance of samples containing known concentrations of the standard protein. 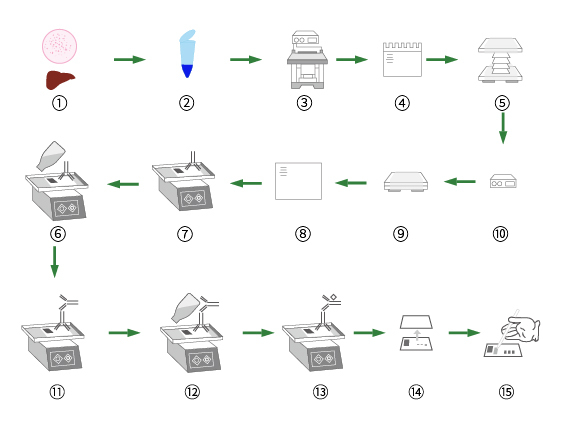 The choice of method of protein quantification is supposed to take into account the influence of factors such as protein structure (standard protein) and interfering substances in protein solution. Measured at 595nm. Low interference factors, the determination is not disturbed by Tris, carbohydrate, glycerol, β-Mercaptoethanol, ammonia, EDTA, etc. Measured at 562nm. The determination is not disturbed by detergent. a. Prepare separation gel according to the protein molecular weight. Shake slowly to mix completely, avoid oxygen in when shaking hard. Pour the mixed gel in between two glass panes, inject anhydrous ethyl alcohol above it to avoid oxygen affect polymerization. For your convenience, our SDS-PAGE gel preparing kit (P1200) and Tris-Tricine-SDS-PAGE gel preparing kit (P1320) including all reagent for gel preparation. To save you time, we provide Precast-Gel to skip the gel preparation step and run electrophoresis directly. 1) Our Precast-Gel is suitable for both denaturing gel electrophoresis and non denaturing polyacrylamide gel electrophoresis. 2) Compared to Tris-Gly Precast-Gel, the Tris-Hepes Precast-Gel can run more clear bands and higher resolution. 3) Please prepare the electrophoretic buffer use the provided power, do not suggest use the Tris-Gly buffer. The loading buffer is used for both Native-PAGE (P1017, P1027) and SDS-PAGE (P1015, P1016, P1017, P1018) which will fit all you needs. 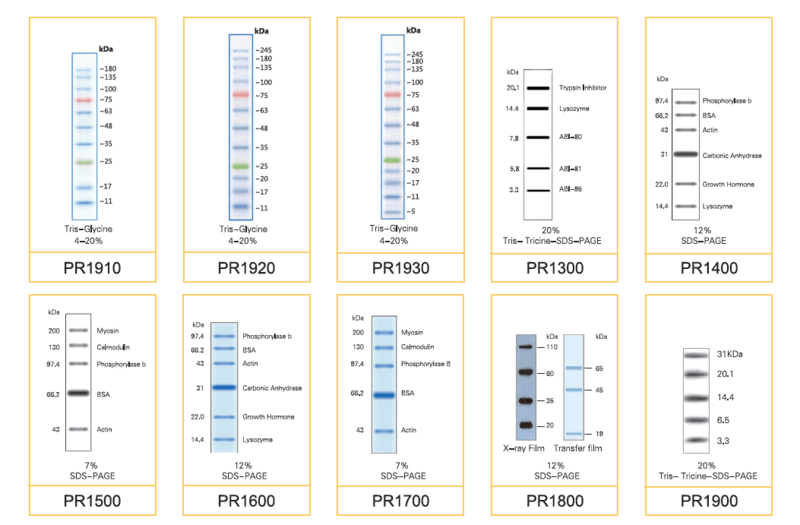 We also have Protein markers of different specifications and uses for your needs. 1) All of these three methods are suitable for gel staining. 2) Silver Staining method (G7210) is more sensitive than Coomassie Brilliant Blue method(P1300 & P1305) , it's suitable for samples with low protein concentration. The transfer of proteins or nucleic acids to microporous membranes is referred to as "blotting" and this term encompasses both "spotting" (manual sample deposition) and transfer from planar gels. Proteins that are resolved on SDS-PAGE are typically transferred to adsorbent membrane supports under the influence of an electric current in a procedure that is known as western blotting (WB) or protein blotting. The Western blot detection system includes HRP-conjugated secondary antibodies and chromogenic agent as well. Solarbio provides reagents and kits for DAB and ECL. P0012 Ponceau S Solution,10× can be used to detect the membrane transfer efficiency, especially for the NC membrane. We provide a Stripping Buffer(SW3020) which can totally make membrane clean and be able to test another antibody in the same membrane. Stripping Buffer can wipe off the antibody without affecting antigen in the membrane. In fact, membrane pattern, type and concentration of antibody, and properties of antigens matter to elution efficiency. Note: Suitable for Western detection of ECL and similar chemiluminescent reagents. Not suitable for Western detection with non-chemiluminescent reagents such as DAB, NBT/BCIP. Choose proper buffer according to your needs . This kit is used for subsequent visualization after adding primary antibody. It is easy to operate and suitable for the detection of highly expressed recombination protein, but its sensitivity is not equal to ECL assay. 2. 10×Concentrated antibody diluent solution , 50ml. This kit is used for subsequent visualization after adding primary antibody. It has been proved 10 fold sensitivity than DAB and suitable for protein detection of tissue or cells. A dark room and other referring conditions are necessary. 4. ECL Detection Reagents, 25mlA+25mlB.